Bowman, Stanley F. Jr. 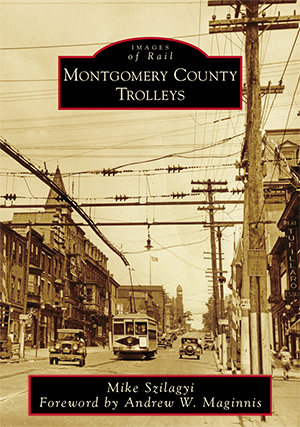 The Trolleys of Pottstown, PA. Privately published, 2005. Bowman, Stanley F. Jr. and Cox, Harold E. Trolleys of Chester County Pennsylvania. Forty Fort, PA: Harold E. Cox, 1975. Cox, Harold E. Early Electric Cars of Philadelphia 1885-1911. Forty Fort, PA: Harold E. Cox, 1969. Cox, Harold E. Surface Cars of Philadelphia 1911-1965. Forty Fort, PA: Harold E. Cox, 1965. DeGraw, Ronald. The Red Arrow. Haverford, PA: Haverford Press, 1972. Foesig, Harry and Cox, Harold E. Trolleys of Montgomery County Pennsylvania. Forty Fort, PA: Harold E. Cox, 1968. Hilton, George W. and Due, John F. The Electric Interurban Railways in America. Stanford, CA: Stanford University Press, 1964. 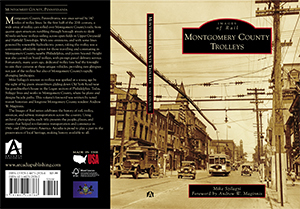 Hocker, Edward W. "Montgomery County History XXXI The Trolley Car Era." Bulletin of the Historical Society of Montgomery County Pennsylvania, Volume 12, Number 4 Spring 1961: 231-237. Print. Goshenhoppen Historians, Inc. The Goshenhoppen Region, Peterkett 1971, Volume IV, Number 1 August 1, 1971: 19. Print. Kulp, Randolph L., editor. History of Lehigh Valley Transit Company. Allentown, PA: Lehigh Valley Chapter, National Railway Historical Society, 1966. McKelvey, William J. Jr. Lehigh Valley Transit Company�s Liberty Bell Route. Berkeley Heights, NJ: Canal Captain�s Press, 1989. Rinker, Harry L. The Schuylkill Navigation: An Illustrated History. Berkeley Heights, NJ: Canal Captain�s Press, 1991. Rohrbeck, Benson W. The Schuylkill Valley Traction Company. West Chester, PA: Ben Rohrbeck Traction Publications, 2005. Ruddell, Ron. Riding the Bell: Lehigh Valley Transit�s Liberty Bell Route. Chicago, IL: Central Electric Railfans� Association, 2015. Ruth, Jay. Looking at Lower Salford: A Visual History of the Township, 1717-1984. Souderton, PA: Indian Valley Printing, 1984. Sauer, Robert E. Jr. and Rohrbeck, Ben. Reading Transit Trolleys. West Chester, PA: Ben Rohrbeck Traction Publications, 1980.